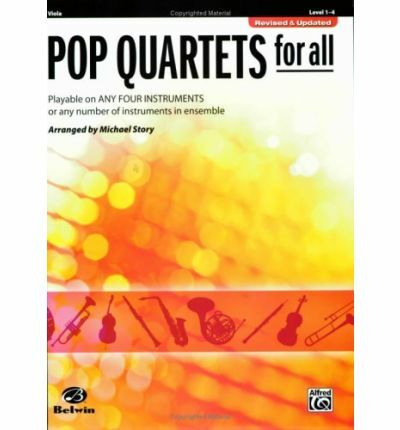 Publisher: Alfred Publishing Co., Inc.
Alfred's Pop Quartets for All series is a versatile, educational, and fun series intended for like or mixed instruments to perform in any size group or combination of instruments. All books are in score format with each line increasing in difficulty from Grade 1 to Grade 3-4. Alternate passages and notation are included to suit instrumental ranges. With no page turns required, the songs and measures are consistent which makes finding rehearsal points quick and convenient. Perfect for concerts with family and friends, recitals, auditions, and festivals. Available for brass, woodwinds, strings, and percussion. Titles are: Summertime * Celebration * We Are Family * Batman (TV Theme) * Imperial March * Theme from Ice Castles (Through the Eyes of Love) * Jump * It Don't Mean a Thing (If It Ain't Got That Swing) * James Bond Theme * Smooth * Gonna Fly Now * Peter Gunn.